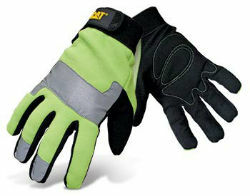 Synthetic leather polyurethane/nylon palm, padded in high wear areas. Fluorescent green polyester/spandex back and reflective tape on knuckle and fingertips for added visibility in low light situations. Adjustable wrist strap for secure fit. CAT® logo rubber patch on cuff of each hand.